Federica Pellegrini is the world record holder in both the 400 and 200 m freestyle events. In the Beijing Olympic Games, she beat Rebecca Adlington into second place in her heat recording an Olympic record time of 4:02.18. In the final won by Adlington in 4:03.22, Pellegrini placed fifth in a time of 4:04.56. Many are mystified by the drop-off in performance. Even Adligton's winning time was slower than she recorded in the heat with Pellegrini. Federica went on to wreak vengeance on the women swimmers at the Games and won the 200 m in world record time. This analysis is at the 375 m mark of the 400 m race. It represents Federica Pellegrini's technique in a state of high fatigue. The capture was in slow motion. It is not possible to state the exact time between each frame but the between-frames times are consistent. The swimmer exhibits a five-beat kick. In Frames #12 to #16, the left leg initially is poised to kick but then does not. The rest of the kicking action is rhythmical. Although there are numerous instances of uneven or broken kicks, on this web site, this is the first instance of a five-beat kick. Two-, three-, four-, and six-beat kicks have been noted on more than one occasion. The latter part of the left arm pull (Frames #1 and #17) shows the hand being turned on its side and producing a sharp slip under the body. This phenomenon is a consistent feature of her stroke (and seemingly undesirable one) for it also occurs in other parts of this race and in her 200 m Gold Medal swim. It is surprising that she could be so good and achieved this level without this flaw being corrected. 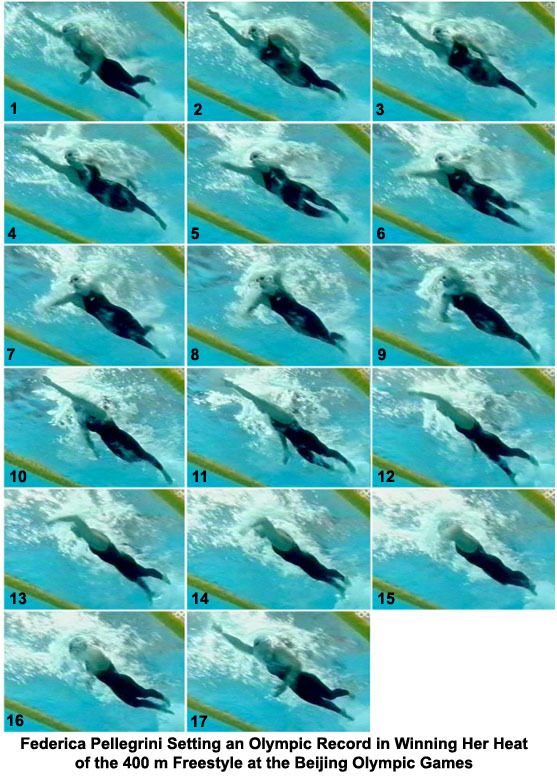 The swimmer's position in Frame #11 shows a full stroke being executed, particularly the long push back with the hand (Ed: so much for "front-quadrant swimming"). Added to that is a full stretch forward. As the right hand finishes its push (Frame #13) the left arm immediately repositions by bending at the elbow and inwardly rotating the upper arm. The position in Frame #12 is somewhat similar to that of Rebecca Adlington and minimizes any negative acceleration that occurs during the change-over of arms. The left arm action during propulsion is very effective. It begins with rapid repositioning of the hand and forearm into an effective propulsive position well in front of the swimmer (Frames #12 through #14). From there the total arm provides a propulsive surface (Frames #14 through #16). From there, the left hand slips under the swimmer which would seem to be a fault. In Frame #10, the right arm appears to do the same slipping action. Following the slip, the hand and lower forearm regain a propulsive function. Within the five-beat kick, there is little occurrence of the legs or feet being in a propulsive position. In Frames #1, #4, #7, and #9, among others, the kicked-foot actually drags the swimmer (the turbulent pocket of water trails the foot) and momentarily has a retarding effect on the swimmer's progress. As well, on the upsweep of the leg preparatory to kicking, there is considerable drag resistance on the lower leg (see Frames #2 (right leg), #6 (left leg), and #10 (right leg)). Those features produce resistance rather than propulsion. Federica Pellegrini could improve if the hand slip during each arm pull were eradicated. The platform exists (streamlining, length of effective pull, etc.) to improve this swimmer's performances further.